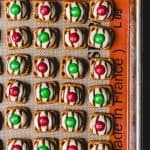 Quite possibly the easiest holiday treat ever, these yummy, poppable Christmas Pretzel Hugs are so simple to make and require only 3 ingredients: pretzels, Hershey's hugs, and M&M's. Arrange pretzels on a parchment or silpat lined baking sheet for easy cleanup. Top each pretzel with an unwrapped Hershey’s Hug candy. Place the baking sheet in the oven for 4-6 minutes, just until the candy starts to melt. Remove from oven and let sit for 1 minute. Press an M&M into the center of each hug. If the hug is still too firm, pop the baking sheet back in the oven for another 1-2 minutes, then try again. Let the candy set until hardened again before serving. They will do this at room temperature, but you can speed up the process by sticking the baking sheet in the fridge for 10-15 minutes. Store in an airtight container.